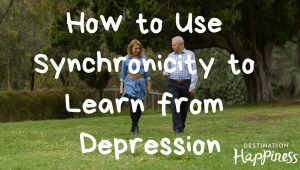 Clinical psychologist and author of Synchronicity: Empower Your Life with the Gift of Coincidence, Chris Mackey, discusses how he’s used synchronicity to reframe periods of mental illness in his own life and the lives of his clients. Synchronicity is the uncanny and fortuitous timing of events that seems to go beyond pure chance. It can act as a guide along our life path, helping us through challenging times and nudging us toward self-fulfilment. This clip was taken from season 1 of Destination Happiness.